CONGRATULATIONS to FAY BRISCOE-WALKER, Ms Montana Senior America 2016! Fay Briscoe-Walker was born into a family of eight children during the depression years but never realized the struggles of that period. Her first memories are of a loving family working together on an Idaho farm, of gathering eggs and riding horses and following her Daddy around. A change of scenery occurred in her teen years when the family moved to the beautiful Flathhead Valley of Montana. The environment was still that of a rural agricultural nature. Yes, she still rode horses and herded cows, even milked a few (by machine). Education was very important but the High School was miles from the home so early morning risings to catch the school bus were a trial and emergency trips to reach home before a "Montana Blizzard" made home inaccessable were all a part of the challenges. Then came collage at Brigham Young University, a mission for the Church of Jesus Christ of Latter Day Saints and marriage to her "Montana Cowboy." Motherhood then became her challenge and the years rolled by bringing into her life a family of eight children, 6 sons and 2 daughters. The challenges & trials of raising a famiy were deminished by the joys of seeing them grow and develop into responsible contributing citizens. Her family tree now numbers 83. Variety is truly the spice of life so while living the role of a wife & mother, she did volunteer work with the PTA, Cub Scouts, L.D.S Young Women's and Children's organizations, and The Womens World Wide Relief Society. She also tried her hand at salesmanship and found it a comfortable fit. 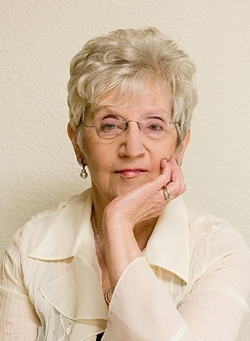 She became a sucessful realtor & was a broker at the time of her retirement. Retirement brought time for developing latent talents and she became involved in the Cowboy Poetry movement, writing and reciting original poetry and organizingy Poetry Gatherings. After receiving the title of "The Lady Cowboy Poet," she appeared at the 1998 Ms. Senior America Pageant. She then acted as the Idaho Director for 17 years. The loss of her beloved husband of 54 years caused a period of searching but the support of family and friends and a new love in the form of a wonderful friend and husband have brought sunshine back into her life. Returning to the scenes of her youth stirred a love of her Montana home and she now joys in the opportunity to represent that beautiful state and its wondeful seniors citizens.